Today I got one of those calls none of us wants to get. When I saw “Dan Rase” on my phone it didn’t matter that I was about to go out the door with my little boy for a father-son evening, this was a good friend calling – even if it had to be short and offer to call back, I was so glad he was calling. Instead it was his wife, Joyce. As soon as I heard her voice I knew something was wrong, but I was not prepared for her to tell me that Dan had gone to meet the Lord early this morning due to a heart attack while he slept. I had just seen Dan at the Kidology Gathering at CPC in San Diego. Afterward, even though it was nearly 11pm, we stood outside enjoying the cool evening California weather and talked until after midnight. We talked about life, our marriages, our ministries, our failures, our disappointments, our hopes and dreams… and our adopted children. It was one of those conversations that marks you and changes you. I was sick that whole week and running pretty weak, but knew that God had me there that week for that very conversation with Dan. We connected at a deep level as our friendship had grown over the years. His wife told me she had to call me today and let me know that Dan had passed away, but that something had happened out there at CPC and that he had come back somehow new and different. And that my friendship meant a lot to him. It was mutual. And I am going to miss him so much. He just celebrated his 43rd birthday last Thursday. 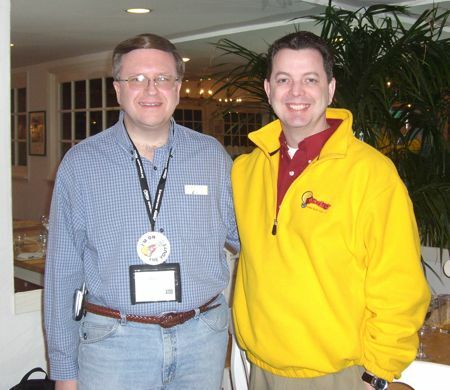 I met Dan several years ago at a Kid U in Columbus, Ohio. He was the children’s pastor at Temple Baptist Church in Portsmouth, Ohio. Later, his wife and daughter came to a Kidology seminar in Crystal Lake, IL. That was when I really got to know them. 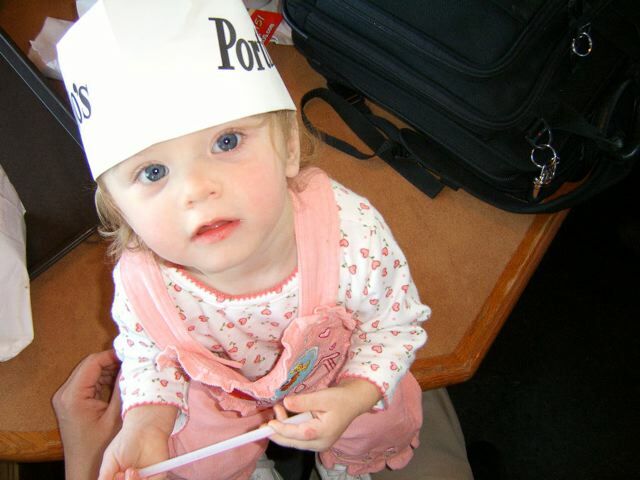 When I heard the miracle story of how Dan and Joyce got their little girl – it was a turning point in Sara and my life in our journey toward adoption. They visited our church the Sunday after the conference and we went out to my favorite restaurant for lunch to get to know each other better. Here we are at church with Dan, Joyce and McKayla, though they called her Kaylee. 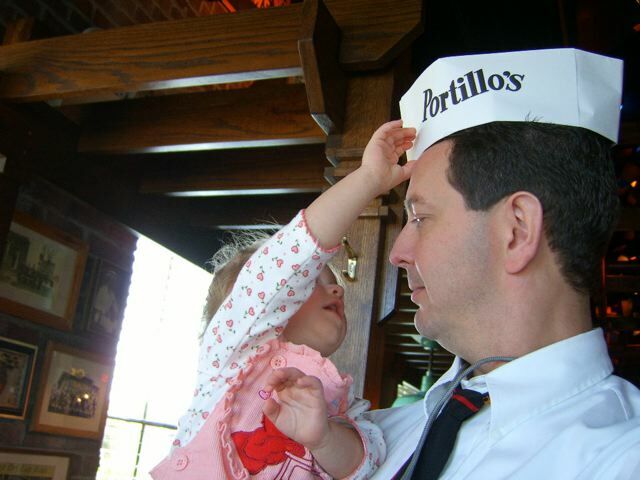 Kaylee wants my Portillo’s hat! 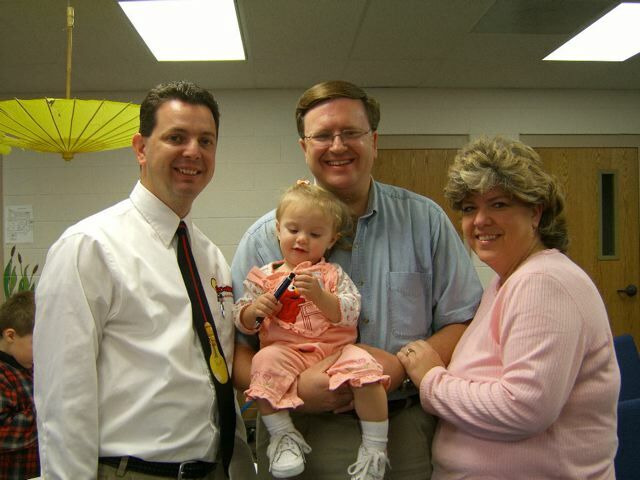 When I tell our story of how we ended up adopting, I have often began with the day I met Dan and Joyce and little Kaylee. It was a turning point for me. When adoption finally didn’t feel like a “Plan B” after not having any children of my own, and instead I began to pray that if God wanted us to adopt, that he might drop a child into our life like He did for Dan and Joyce. Five months later, that’s exactly what God did. My friendship with Dan continued to grow. We crossed paths again at the Kid U in Columbus in 2006 where he and Joyce got to meet Luke. (We still have the little toy they brought him as a gift.) 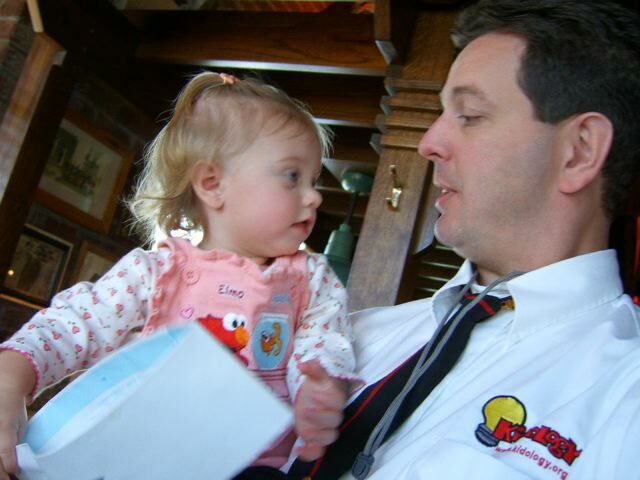 In 2007 Dan served on the Kidology CP Team and through the application process for that I got know him even better. I was blessed to grow up in a Christian home where both of my parents not only professed faith in Christ but lived it out in their daily lives. In December of 1973, my home church was conducting a Revival Meeting with Evangelist Ron Comfort. As he spoke during the Thursday evening service the Lord began to work in my life and for the first time I realized that my godly heritage was not enough, that I was lost and needed to be saved. I did not do anything about it that evening. However the Lord continued to convict me of my need, and that next day, at the age of eight, I curled up behind a chair in my grandma’s house and asked Christ to save me. When I came to Temple my job description stated that my primary responsibility was to head up the youth ministry and my secondary responsibility would be to “oversee and administer” age three through college. This worked fairly well for a couple of years until I found myself in a predicament, an overseer with no one to oversee. After endless efforts to recruit volunteers and many hours of prayer it seemed that God was leading me to take an active role in our children’s ministry. So I entered into the world of children’s ministry. I can’t say the transition was smooth. There were a lot of doubts and fears I had to overcome. For some reason speaking to younger kids intimidated me. I was very comfortable speaking to teens and adults, but I was afraid I could not put the truths of God’s Word on their level. I later found out that I was selling them short when it came to their ability to grasp spiritual truths. It is hard to believe, but this fall was the beginning of my sixth year of active involvement in children’s ministry. As they say time flies when you’re having fun. I use to say that youth ministry was my real passion, but that has really changed in the last several years. I love children’s ministry, and have found it to be a place where my creativity can really flourish. I continue to head our student ministry and still enjoy it, but the scales of my passion continue to tip more and more to the side of children’s ministry. Dan was such a thoughtful man. He had that gentle and quiet spirit that I seem to always be working on. He was humble and focused on encouraging others. As a follower of my blog, he was aware of some of the trials I’ve been through and the lessons I’ve been learning in life and occasionally write about and so he brought a book to CPC to give me that had meant a lot to him. The book is WHAT MATTERS MOST (When NO is better than YES) by Doug Fields. One of the joys of large conferences is that I get to meet a lot of Kidology members or people who have appreciated my ministry, but no one has ever brought me a book before. I was taken aback by the simple thoughtful gesture to invest in me as a friend. Dan, I am sure going to miss you. I feel like I was just at the beginning of a life-long friendship – but at least I’ll have all of eternity to make up the missed time here, because I’m not really ready to say good bye, but I thank you for being a friend to me. I needed it. Luke thanks you too for helping prepare his daddy to be ready the day the phone rang and he needed a home. Early today I was pretty stressed about a lot of “to do’s” that I am behind on. After Joyce called, it all evaporated. Oh, sure, I still have to do them… but they only need doing because I’m here to do them. Dan’s life will be the reminder to me to focus on WHAT MATTERS MOST because when our time on earth is over, it is all that we truly will leave behind. Please pray for Joyce and Kaylee and for the kids at Temple Baptist Church Wednesday is the big Easter Extravaganza that Dan has been planning. May the Lord make Easter extra special as they realize that the same Jesus who rose from the dead has also raised Pastor Dan and together they are celebrating Easter where the Son never sets. I met Dan for the first time at the Kidology gathering at CPC, and also later in the exhibit hall. He was gracious to take a moment to pray for me with heart-felt passion for the Lord. Spending time with him was one of the highlights of my time in San Diego. I am saddened to learn of his passing. My heart goes out to his wife and family. They will surely be in my prayers. Dan was a great man of God. He was my youth leader when i was young and a very close friend to my family. We shared many happy times with Dan and loved him. He was always there for his youth, his church and the family. It is a small world as I found out tonight that you knew him. I have known him since I was just a baby and will always remember him. I thank you for writing this about him and taking the time to share your thoughts about him. We love you Dan and will miss you, but we will see you again someday. I know Dan from him being on the CP Team. I am truly sad to hear the news that we have heard. I will be praying for his family. Let me add my prayers for Joyce and Kaylee, their family, and the church. While I have not meet Dan I know from the above words that he was a man of GOD that followed His leading and loved others with the compassion and love of Christ. 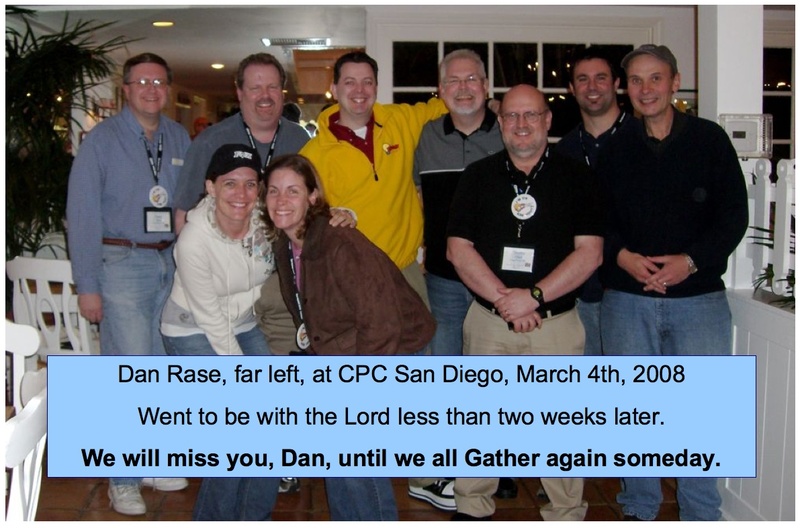 Dan you will be missed here and we all look forward to that great reunion ahead. Sounds like he was a real instrument of God while here on earth. I wish I could have met him in person. I feel like I know him from his posts on the forum. Karl, Thanks for sharing from your heart, I know for me that’s what makes you such a wonderful friend to have. I can’t wait for our great reunion with him and others who have graduated early. Will be praying for the family and church family. What a wonderful story and a beautiful tribute. I even found myself getting choked up. The relationships we stumble into can serve a greater purpose than we can see at the time they begin. Ah, the amazing wonders of belonging to the family of God! I am praying for his wife and little girl. Man, what a shock. I had some good times with Dan at CPC the other day. It was plain that God was doing something special in him there at the conference. His questions where filled with such hunger. I will miss him and look forward to our reunion. He was a fabulous guy! God blesses us with friends. The ones who are especially dear are those who are in simular places at the same time. Either the ages of our children or the ministry we are in. When we lose those friends it is especially tough. It puts our life into perspective and makes us think about what kind of parent or minister we are. But most of all it makes us sad. Not for our friend of course. They are having a blast up with the Lord. The rest of us plug on with the memories and the race still to travel. Wow….incredible! During the conference’s “Dinner on the Town” event, I decided to go to Kelly’s there at the resort. I couldn’t find anybody to link up with, so I started wandering that direction. I ran into Dan on the way, whom I had met the night before at the Kidology gathering. He had no dinner plans either, so the two of us went there and shared, not only a good meal, but our history, struggles, and dreams. It was a very nice evening. Our prayers are with Dan’s family at this time. Love you big brother. I will be praying for you, his wife, Kaylee, and his church. Thanks for sharing. I feel like I know him a little bit because of your post and cannot wait to meet him on the other side. Thanks for caring enough about people that you take time to share and reach out to others in their time of need. What an Easter Story. Because our Savior lives, we know that Dan is more alive than ever. My wife and I will certainly be praying for Joyce and Kaylee. May they find the comfort and love that only the living Lord can supply. May the words of testimony given here also provide love and encouragement to make this time of shock bearable. May the grace and kindness of Jesus surround them. Just read your blog and about Dan’s passing. So young! I’m turning 43 in May and can’t even imagine the shock and pain his wife and daughter are going through. Thank you for investing in others the way you do. Stories like this are reminders to keep everything in perspective. I will be praying for you as well as Dan’s family. lesson to the teens was, “Reconciling Friendships.” I pray that we all learn from the unexpected loss of Dan, and reconcile with those we need to. Thank you for your words of testimony about Dan, he will truly be missed. I’m praying for Joyce, Kaylee and all his many family and friends that are experiencing a huge hole in their lives today. Death is a shock on every level, whether it is expected or not, especially with someone so young. My cousin died at 39 of a heart attack. My husband’s brother of cancer at 46. In 27 months, we lost 5 family members and the young worship pastor at our church. Its been a few years now and as I look back, I see the gracious hand of God comforting, providing, gently caring for those left behind. He took the pain of those losses and did some amazing things that could have happened no other way. Watching how God cared and provided for my sister-in-law and the children since that time gives me confidence that Joyce and Kaylee will be okay. It will not be easy but if we can fix our eyes on Jesus, the author and finisher of our faith, He will truly prove to be the Comforter we need. My prayer is that everyone touched by Dan’s life and death will experience God’s incredible peace that makes no sense. Wow, I was at that Crystal Lake event, and heard their story of how their daughter came into their lives as well. I didn’t put it together from the news letter. I’m glad he is in the best place he could be, but I will be praying for the family and friends especially their daughter. I have never met Dan, but the story did make me realize about my two boys. Time is short, and that’s why we have to cherrish every moments we get. Spending time together with our family, friends, etc. What we will leave behind is very important and worthyfull for those who left behind. My condolences to Dan’s wife, family and friends. I’m sorry for your loss, Karl. I have literally known Dan all my life. My dad did also. In fact, my dad’s family was one of the first families that Dan’s parents called when they found out that they were pregnant with him. I feel so special just because I knew him. He was a wonderful man of God and will always be remembered by all of the people he touched. He was loved by people all across the country. Karl, I am so sorry to hear about the loss of your friend. I lost my husband to leukemia at the age of 43. Such a young age to die! And so hard for us to understand. While going through my own time of mourning, I came across this verse: Psalm 116:15 – Precious in the sight of the Lord is the death of His saints. While I had probably read that verse before, it never had the impact on me as it did during that time. While loss is difficult for us who are left behind, it’s a comfort to know how God rejoices when one of His children comes home. It’s a beautiful picture. God’s love is so Amazing! Thank you to everyone for the prayers offered up for Kaylee and myself. At Dan’s visitation tonight someone told me about Pastor Karl’s most precious and heart felt words. I couldn’t wait to get home to read for myself. I never realized that I would be so blessed by the love that was so beutifully expressed and then I read all the wonderfull comments. Thank you all for the prayers offered up for us they are sure felt. I’ll write more soon when my head is a little clearer I just want to let you all know, I am doing good and Kaylee is also doing good. God is great! Your “letter” is an inspiration to stay focused on what is important! God first…family next…friends…people. If we follow Jesus’s example, He pretty much spent time with His Dad, His disciples and people that needed a touch. Don’t read about too many “programs” He spent time creating or supporting…He just poured into people. From what I see, that seems to be your heart’s desire. Dan can’t be replaced, but I do believe God can and will give you another friend/brother that will help you accomplish God’s plan for your life…one that will stick closer than a brother! Be Blessed…will continue to pray for you till we meet at Yosemite Summit in May…and beyond. We praise God for Dan’s life, even though in our minds it wasn’t nearly long enough. He left a big empty spot at Temple Baptist Church and in our hearts as well. We will miss him. You will continue to be in our prayers as will Dan’s Mom, Dad and his sister and her family. May God give all of you the peace, comfort and strength that only He can give. We love you! I’m so sorry to hear about your friend. I lost my friend Kris this fall. she also was 43. It was so painful to say good bye to her. And every Sunday as I see her children with no mom, it stings again. Praise God that my friend is also in Heaven. Hang in there Karl. This brush with the reality of life can help you stay focused on the important things of life, just as it does with me. Well, here it is – the one year anniversary of Dan’s Promotion. He was my co-worker at Temple Baptist. 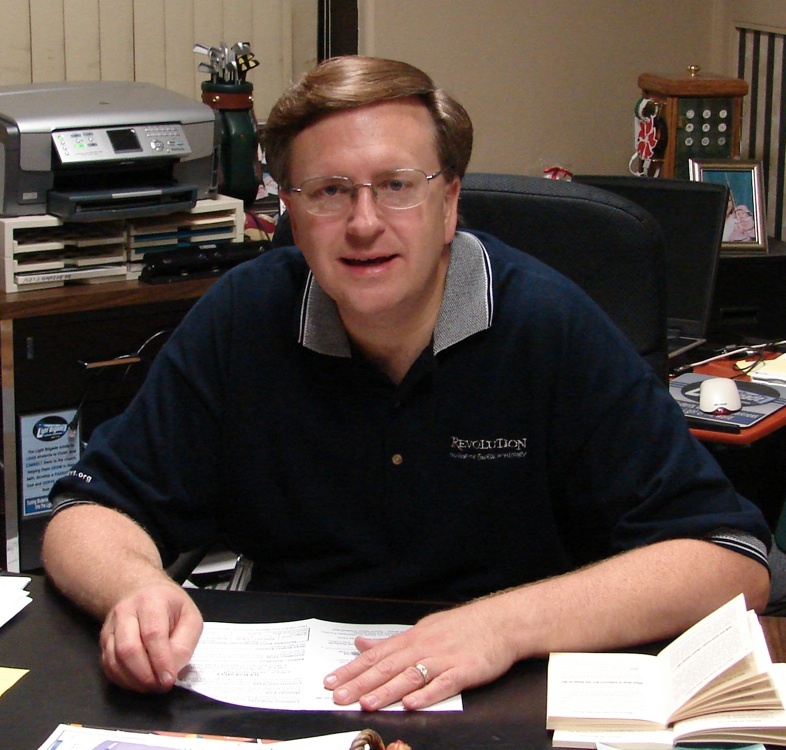 I am the Church Secretary and each morning when he came into my office it was the same. BIG smile and “How we doin?” He’d check his mail and messages, and we would spend a few minutes talking. 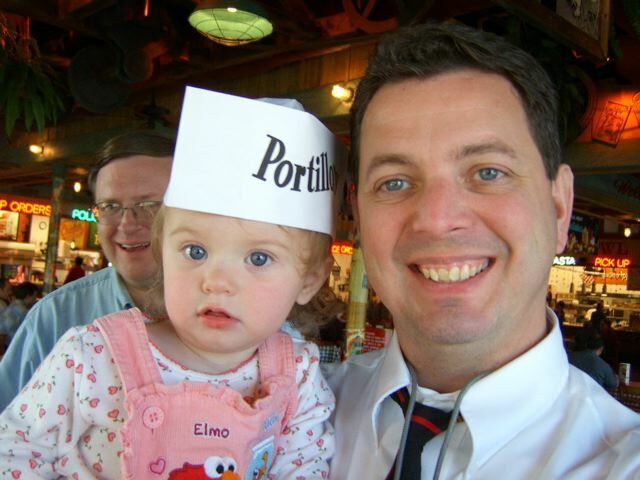 He took a personal interest in each and every student and the conversation would inevitably turn to my daughter Lauren – an only child – and her growth in things of the Lord. Dan was a wonderful leader with the teens and because of his love for them they grew in their own PERSONAL relationship with the Lord. They also learned about Cedarville University – his alma mater. The first year he was here he took the third – sixth graders to an event at CU and on that day my third grader daughter looked at me, with shining eyes and said, “Mommy, I didn’t know you could go to college and learn about Jesus, too! I’m going to Cedarville when I grow up.” In her senior year in high school we traveled to other Chistian colleges but there really was no need. It was Cedarville for her. Dan wrote the most precious letter of recommendation for her and yes, you guessed it, she is now a second semester Freshman at Cedarville. Dan died in March and she graduated high school in May so he did not get to be with us that day and his absence was fully felt. But Lauren and a friend sang a duet at the Commencement Ceremony from the Broadway play “Wicked” entitled, “For Good.” If you know the words, you know the general subject is that because she knew Dan, her life was changed FOR GOOD. In all it’s interpretations. Today we plan to gather at his earthly resting place and praise God for the comfort of knowing that he is absent from that body and present with our Abba, Papa, Father. Please continue to pray for Joyce and Kaylee, his parents, his sister and her family and for the Teens and Children who still love him and miss him.